This article is from the book 'The Yate to Thornbury' Branch by Colin G Maggs published by Oakwood Press. I have now got the working of the Tytherington stone quarries and anticipate doing a large business in stone. I want a short branch line made into the quarries off the main line. I shall have much pleasure in laying down the branch line at my own expense and subject to the approval of your surveyor if you will allow me. I shall be glad if you will give me a special rate for the carriage of stone on your line. I will guarantee you 6,000 tons of stone per annum on your line from my quarries. The result of this communication was a Private Siding Agreement dated 22nd October, 1884 allowing him to lay a siding to West Quarry. This standard gauge siding replaced a narrow gauge tramway which hitherto had brought stone to the Midland Railway's siding. A second standard gauge siding to West Quarry was added under a Private Siding Agreement of 28th February, 1895. The quarry was eventually taken over by Roads Reconstruction (1934) Ltd and a Private Siding Agreement made on 16th May, 1953. Hardwicke also owned Church Quarry on the opposite side of the line and a Private Siding Agreement was made for this on 22nd June, 1898. This quarry was also taken over by Roads Reconstruction and a Siding Agreement made with that company on 6th August, 1936. 1. Hardwicke had no right to work his minerals on its land and could therefore only obtain nominal damages. 2. That it had a right to quarry all stone included in its boundary down to formation level. 3. That it had the right to remove stone dislodged by landslip however caused, including judicious increase by artificial means. Green was of the opinion that the MR was wrong in each of these contentions. J.P. Sturge Sons, surveyors, Bristol, made a report on 23rd June, 1885 and advised that Hardwicke's remedy would be to recover the value of the stone taken and bring action for damages. Judging from stone lying on the ground, Sturge said: The stone itself is of very good quality for building and some of it has been worked into large blocks and coping stones suitable for bridges and other railway works. Stone of this description with siding communication, to a Railway is worth a royalty of 4d. per ton, which on 20,680 amounts to £344 13s. 4d. If Hardwicke brought an action for the recovery of this amount, the company might allege that stone in this situation is not worth a royalty of 4d. per ton because Mr. Hardwicke had no right to convey it over the MR line except by constructing and working a siding which would cost nearly, if not quite, the value of the stone. Hardwicke sends 100 tons of stone per day, say 30,000 tons per annum at average railway carriage rate of 2s. 3d. per ton equal to £3,375 per annum. Having the entire control of his traffic, the MR are in a position to charge the maximum legal rates and if Hardwicke got at cross-purposes with the MR they might make his position difficult. Messrs Sturge advised Hardwicke to forgo all claim for damages in consideration of a reduction in his carriage rates of ld. per ton, which on 30,000 would amount to £125 annually, this might be made up to the MR by increased traffic to the advantage of both parties. On receiving this advice, Hardwicke telegraphed to Green QC saying that he would forgo all claim in consideration of a reduction in carriage of ld. per ton. The outcome of this is not known. 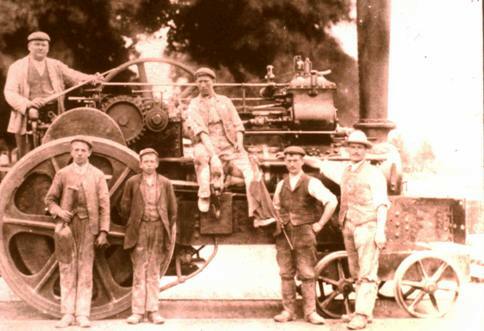 The first engine to shunt Church Quarry was Iron Duke (photographed left), a conventional road traction engine converted to 4-2-0. 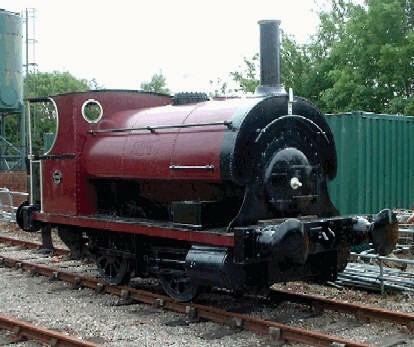 This was replaced by Daphne, a Peckett 0-4-0ST of 1899, Works No. 737, purchased new and eventually sold to Pilkington Bros, St Helen's, Lancashire in 1923 and now residing at the Ribble Steam Railway Museum in Preston. Daphne was replaced by Catherine, a 0-4-0ST built by Hunslet in 1882, Works No. 282, and obtained in January 1919 from the Admiralty Shipyard, Portbury. Traffic in the West Quarry was worked by a steam crane. Internal 2 ft gauge rail traffic at both quarries ceased by 1948 as it had been replaced by road haulage. 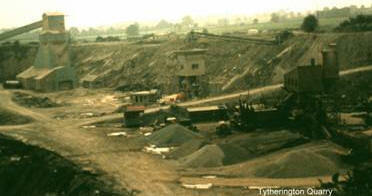 Grovesend Quarry situated between Tytherington and Grovesend tunnels, was also owned by Hardwicke. The Private Siding Agreement was dated 17th May, 1888; the siding laid 26th June, 1888 and brought into use by 4th July, 1888. On 31st March, 1904 a Private Siding Agreement was made with Aird & Co. to lengthen the siding and convert it into a loop. This was done in connection with the quarry's first major contract - stone supplies for the construction of the Royal Edward Dock at Avonmouth 1902-8 carried out by John Aird. A small mobile stone crusher was used at the quarry from 1902 and steam drills introduced in 1904. Sixty to 65 railway wagons carrying about 8 tons each were sent to Avonmouth weekly. During World War I the quarry was taken over by the Road Board and stone dispatched by rail. In post-war years the Teign Valley Granite Co. took over the quarry, installed overhead loading machinery, laid additional sidings and made a Private Siding Agreement on 7th March, 1921. Apart from stone, Tarmac was forwarded and a considerable tonnage of coal arrived for quarry consumption. Until the 1950s, granite arrived from the parent company's quarry at Trusham, Devon. On one day each year, ganger George Clutterbuck, employed by the LMS, stopped and obtained the signature of every lorry driver entering Grovesend Quarry in order that the railway retained the right of ownership of the land on which the lorries stood. A Private Siding Agreement was made with Roads Reconstruction (1934) Ltd on 7th July, 1958 and the agreement terminated on 30th September, 1967, following which the line closed. By 1956 an electric weighing machine enabled trucks to be weighed when travelling up to a speed of 4 mph. The quarry used a tractor for internal shunting. Although the March 1937 Working Time Table Appendix said that not exceeding 15 wagons may be propelled from Thombury to Grovesend Quarry, with a brake van at the leading end, this method of working was rare. The usual way of working the siding was that en route between Thombury and Yate, wagons and brake van were left on the main line while the engine picked up the loaded stone wagons and proceeded through Tytherington tunnel. As the engine and loaded wagons could not readily reverse up the 1 in 64 to collect the brake van and wagons left on the main line, some drivers arranged with the guard that the engine would work the six or seven loaded ballast wagons through to Tytherington where it would wait. The guard would then let the brake van and the remainder of the train run down the gradient and join the ballast wagons at Tytherington station. On one occasion the guard failed to stop the train in time, crashed into the ballast wagons, his own van falling apart and his injuries causing him to go to hospital. The quarry gave the drivers a 7s. 6d. tip weekly to be shared equally by his fireman and the guard. Those working Christmas week were lucky as they received 10s. each.